It has gotten cold here ... very cold. Well, maybe not Alaska cold, but it's still dang cold. It makes me want to be in other places ... like the photo above. I was going through my archives today and came upon it. It was a small little town (whose name I have forgotten) in Portugal when we were there the summer of 2006. I always loved that little town. Everything was so colorful. But ~sigh~ not so much color here right now. 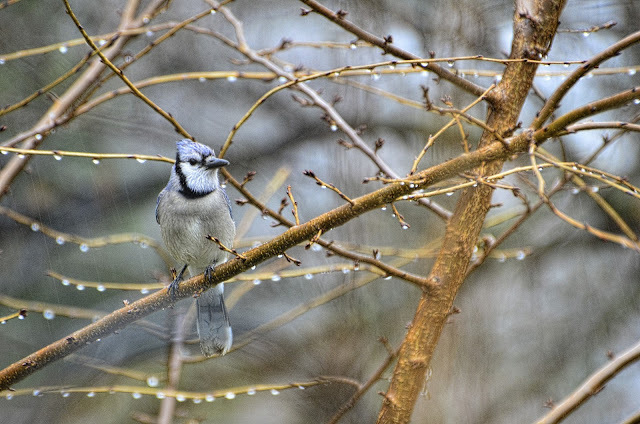 I was surprised the other day during the rain when a Blue Jay stopped by. I had not seen one for at least several months. And I actually heard him before I saw him. As did all my other feathered friends who quickly scattered. I don't think he is very popular. But he's not the only one not very popular around here. This guy stopped in later looking for a meal. This was the third time he has stopped in this week. As far I know, he hasn't scored. 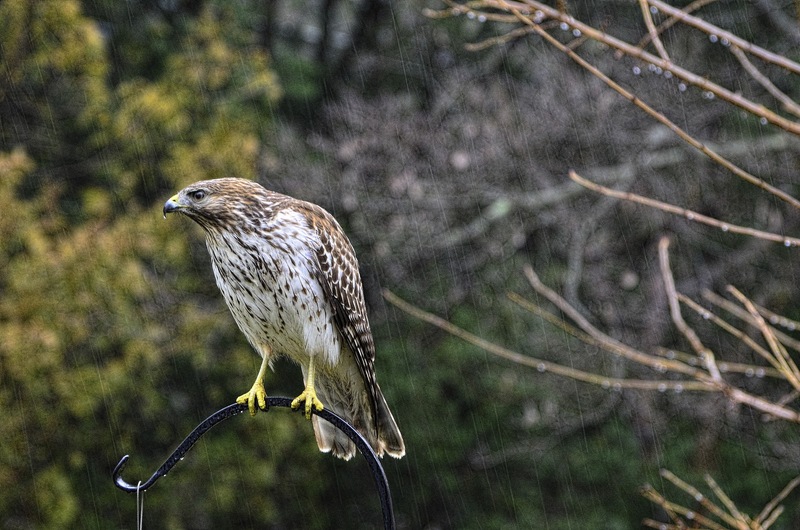 But this was his most boldest move ... sitting on my bird feeder right outside my window. Even as I was shooting through the window, he didn't seem to mind my movement. He hung around for several minutes and then took off. And that is exactly what The Professor and I are going to do. A snowstorm is moving in with snow and sleet. Not going to be a good day to fly. and having a margarita or two or three. safe travels! load up those bird feeders before you hit the road or your birdie friends will not be pleased! Oh, do have a safe trip, Reena, and enjoy the sunshine and warmth! Love your birds for the day! I'd love to be able to step inside and see what's behind that stunning turquoise door! Enjoy the warm breezes down there in FL! Safe travels! I think the warm sand and margarita sounds pretty good. Ya know, it's not the temperature, it's the humidity (how many billion times have you heard that?). Nice sequence, love the hawk. Come on down. The weather is fine. Hit 70 today. Where you'll be, even better. Oh lucky you.. safe trip, Reena. Wonderful birdie shots and that blue door is just beautiful. Oh, that scene from Portugal is so beautiful! But the color of that Blue Jay....wow, it looks periwinkle in your post. Again,you have captured some fabulous bird images, Reena. Oh gosh, I hope you're not flying in this snow, sleet and ice that we're having!!!! I'm beginning to worry already! I'm crazy about the first picture, such a gorgeous and romantic entrance, everything and every detail about it is perfect. So this is where you stayed? The jays are not popular among other birds because they are big bullies!! I have seen them pull worms right out of another's beak!! Great shots of the hawk!!! Ours will never hang around that long, they are not bold enough. That door is really beautiful....and the Blue Jay is amazing. Have a great time in the warmth ! Fantastic photos. LOve the fly away. Have a wonderful, warm time in FL! That blue jay is a real beauty the way you have captured the magic of his colour. 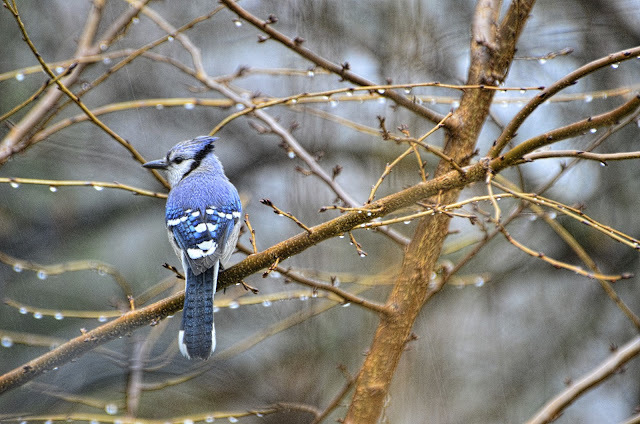 Haven't seen any blue jay's here for a long time. Your hawk captures always blow me away. Wish I could come with you to dip my toes into some warm sand . . . . aaaaah. Enjoy. Hi Reena, the jays do seem to scare off any little birds at your feeders. And wow, I'm sure that hawk sent even the jay into hiding. Awesome shots and I love the first image of the colorful door. Have a great time in Florida! I wish I was going away from this snow and ice too. Great images. The Blue Jay is just beautiful and so is the hawk. Your door image is spectacular! 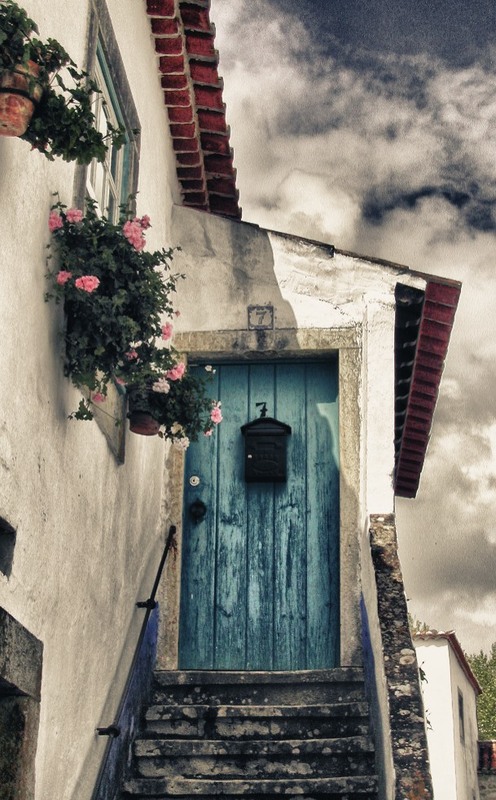 Love that door, the color, the angle. Very, very nice. Lovely bird photos ~ excellent! Gorgeous shots of the blue jay and hawk. Enjoy the warmer climate and report back here when you can! trekking your superb blog! keep blogging and inspiring people! Have a safe trip and a tall one for me! Beautiful photos, especially the jay and the hawk! Can we go with you to Florida?? Please please please, cuz it is COLD here too!! 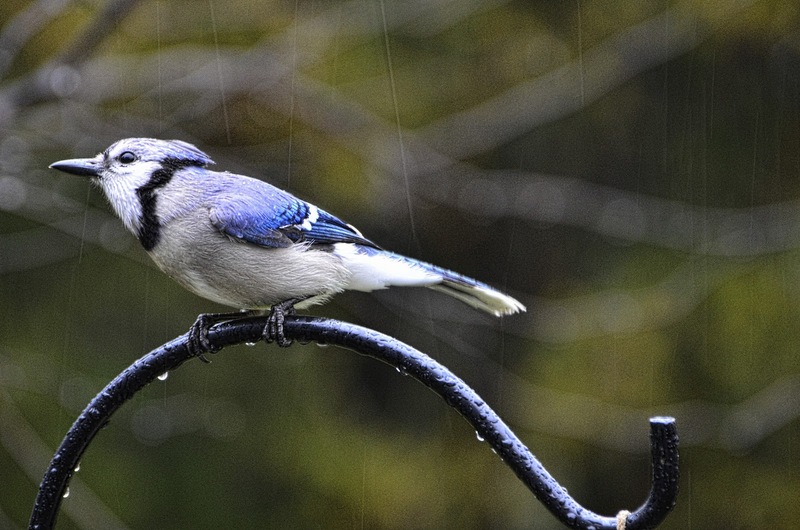 Wow - that blue jay is a delightful splash of colour! These are all wonderful! I enjoyed them. Really beautiful photos, in spite of the dreary weather. I used to see bluejays like that all the time when we lived in the midwest, but we don't have them out here in California. 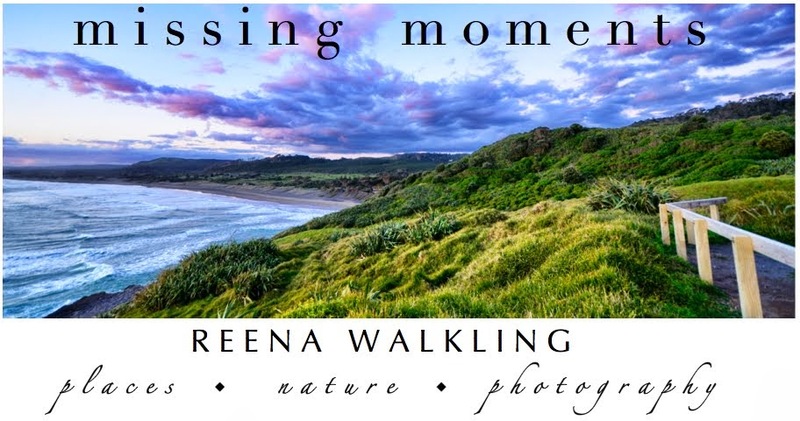 The photos are so beautiful, have a nice journey Reena. Oh...you made me smyle:I remember a song like that!!! And...GREAT ...your photos are GREAT! What amazing photos.. I love them all!!! Have fun in Florida my friend. It sounds heavenly.. The Cooper's Hawk shot from you window was fantastic. I love the action shot. Safe travels and we look forward to seeing your footprints in the FL sand. Love the rain drops streaking across your photos. 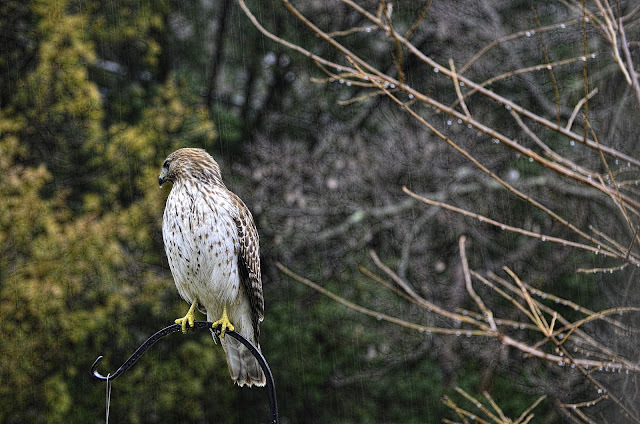 And that hawk -- he's mighty brave. Don't you just love the colour of that door. The bluejays here let us know they've arrived so we'll throw a few peanuts. Wonderful shots of those birds. Looking forward to seeing your pictures of Florida. Enjoy. It's Scotland for me....now we're talking cold!! I love that first picture and the blue jay and hawk are both beautiful. Oh, love that first shot! Glad you get to escape to Florida! You two are always on the go! It will be 82 here in Florida today! Come on down! Great post! Love the textures .. did you use NIK? Thanks for your lovely posts. What a great group of images. The stairs leading to that door is a heart-stopper! I, too, just spotted the first bluejay in our backyard. It's been ages! I love how the subjects pop from the textured background. Have a good trip! Oh I love these! Have fun on your trip! The photos are lovely...I really like the blue jay-you can see all the textures in his feathers! you don't stay put for long! your photos of the birds in rain are smashing. safe travels Reena. hope your toes are really warmed by that sand. take care now. the blue jay is so beautiful! as is the gorgeous shot of portugal! Hi there - I have just returned from the wild, woolly and less that wonderful world of wireless only internet - so now I'm catching up. Great pictures – how can you mind the cold when it brings birds like that! Hat, scarf and a hot chocolate and all is well. Enjoy our Florida sunshine!! 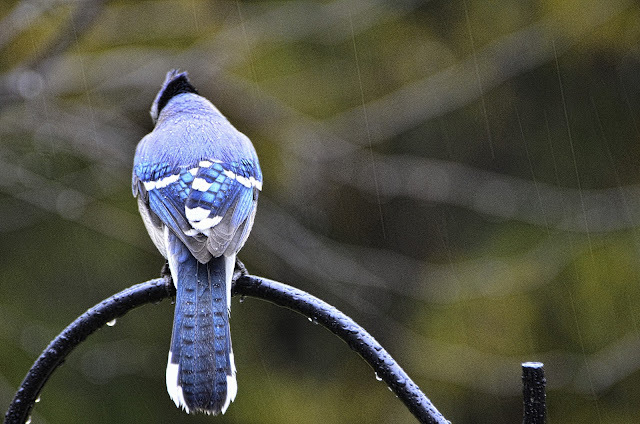 Love..love..love the pix of the sweet blue jays! It sounds great to go to Florida!! 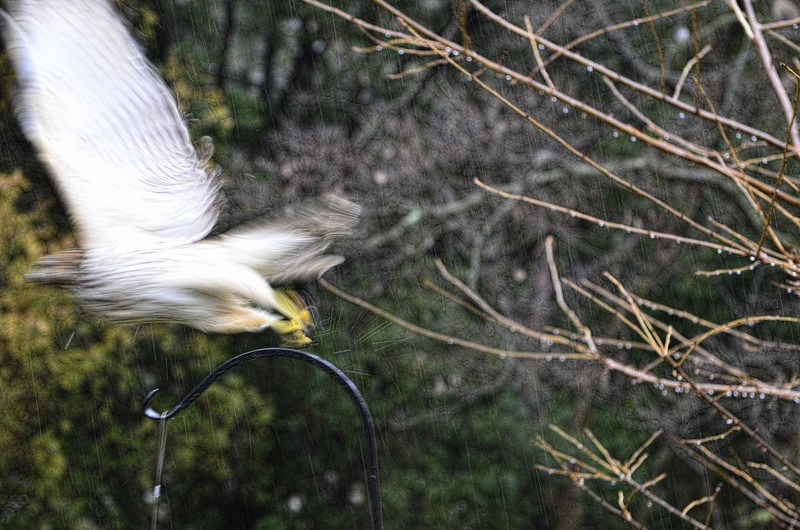 Great photos of your beautiful feathered guests!! I adore your shot of the comical Bluejay. I kinda think they get a bad wrap! As I am reading this I imagine you already have your feet in the sands of Anna Maria Island...I am enjoying the snow for now since we have had to wait for it so long this year...but still would love to get back there one day! Everything is beautiful, but the perspective and color of the door photo... sigh. Wow, Reena! I am stunned by these photos! First the Portugal door – divine! 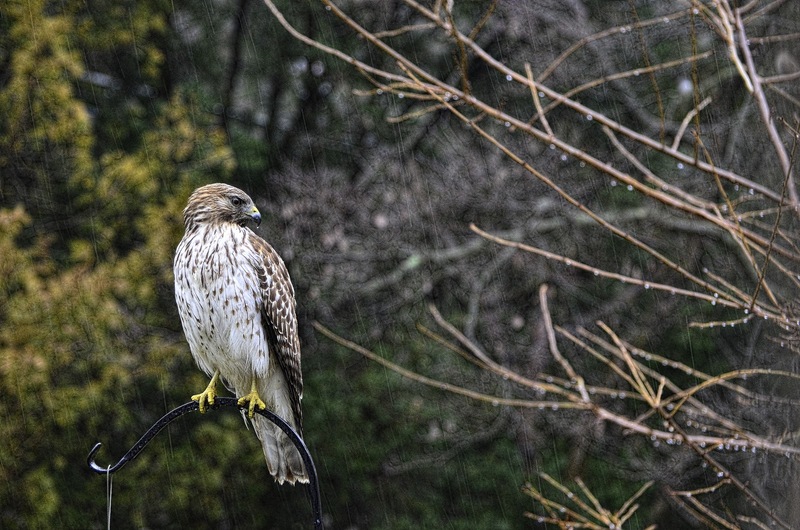 And the birds and hawk – amazing! I would be very nervous having a hawk in our yard. Although we see them circling, and bald eagles, too, we are protective of our sweet songbirds.